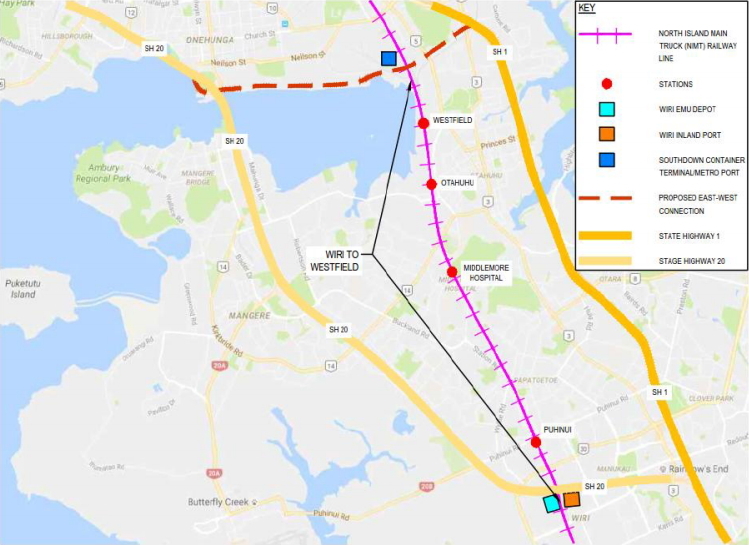 The proposed third main between Westfield and Wiri – and eventually further north and south – has long been considered one of the most important rail projects in Auckland, if not the country. Being one of the busiest sections of rail for passengers and the busiest section of rail for freight in the country it has long been suspected to deliver huge benefits. Yet bizarrely the project still hasn’t been funded. We wanted to see how the project stacked up and so Harriet fired off an Official Information Request to Kiwirail to obtain a copy of the business case. Last week things got a little crazy after Winston Peters revealed leaked emails in parliament showing that the Transport Minister’s office was trying to block it being released to her. By the end of the week, Kiwirail had advised that they would release the business case publicly, and that occurred this week. Unfortunately most of the key details in the business case have been redacted but what remains paints a picture of a project long overdue and deserving of funding now. In fact, what is visible suggests this project would have a benefit to cost ratio that would put to shame most of the road projects being built and prioritised by the NZTA. Here are some of the interesting points to take away from the business case. First, the document is clearly an NZTA template – while this will be the “misleading template” the ministers office tried to use to block it but I actually think it’s good that the NZTA were involved. The lack of capacity is resulting in delays to both passengers and freight. 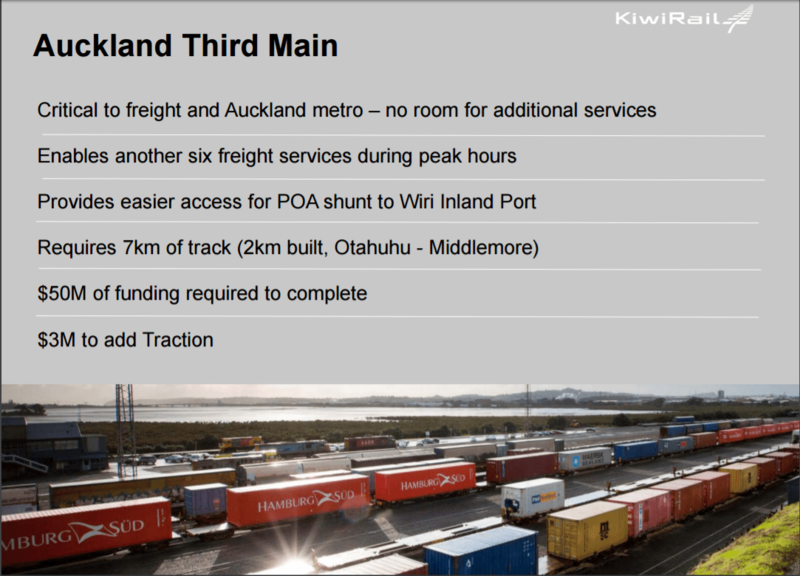 For freight the case notes that Kiwirail are seeing an increasing number of their services arrive at the outskirts of Auckland on time, only to be delayed and end up outside their promise of “delivery within 30 minutes” of schedule. For passenger trains, it notes that to accommodate the freight trains, delays have already been built into the timetables. As of mid-2016, the effect of the delay sees those 5 million passenger trips experience an average delay of 3 minutes each. That’s about 250k hours annually. That 3 minutes time saving is also enough to free up one EMU which can then be used to improve capacity elsewhere. But it doesn’t stop there. The need to accommodate freight trains It is also the reason why the Southern and Eastern line services can’t run to a consistent 10-minute timetable. This results in passenger service headways varying between 8 and 12 minutes depending on the time of day. The lack of capacity will also prevent us from being able to take advantage of capacity enabled by the City Rail Link. To put a few of those aspects in perspective. A 3-minute time saving for 5 million trips is about 250k hours of time saved annually. My guess, based on a quick look at the NZTAs economic assessment guidelines is that this could be equivalent of over $4 million annually. Each EMU is costs around $10m so saving one would make a nice dent in future costs and of course give is more capacity. All up there look to be some quite significant benefits that come from the the project and they appear to stack up pretty well to the estimated $50 million cost to implement. Sadly, all the numbers, including the BCR range, have been blacked out. This comment though seems to confirm that they are significant in relation to the costs of the project. It wouldn’t surprise me if this project has a better BCR that almost all roads currently under construction or in planning by the NZTA. Was this the reason the government didn’t want it released. Regardless it once again begs the question of why it hasn’t been funded. Do the government need to provide a reason why they’ve blocked the economic information in the proposal? Is there some way to force them to release the full report? The provide the section of the Act by the redaction. The document referenced different subsections of section 9 of the Official Information Act. s9(2)(ba)(ii) covers information provided confidentially, where revealing the source might lead to that information not being provided in the future (this reason would seem potentially justified). The BCR was withheld under s9(2)(j) (enable a Minister of the Crown or government department to carry out negotiations). s9(2)(g)(i) was also cited frequently – “maintain the effective conduct of public affairs through the free and frank exchange of opinions between or by or to a Minister of the Crown or members of an organisation” (paraphrasing a bit there). Ahh life under the corrupted OIA. You can’t blame them, they’ve got away with it for years and buried bad news. “Who are the donors to the Party in this project and who of us have got shares in the companies involved in the project? Answer. “Its all Kiwirail, there are none and nobody, it benefits the public!”. Ministerial outcome – “Get the hell out of my office then and stop wasting my time”. I believe the Ombudsmen have had opinions about the overuse of that one by this govt. I hope they review these redactions with urgency to make an example of the officials who did this. While there might be genuine reasons for some of the redactions in the released report, you can’t help but feel a lot of the crucial detail was omitted for political reasons. I hope the Ombudsman reviews the report to check the validity of the redactions. This government has spent the last 9 years pouring money into every motorway project they can find. If trucks use it, it’s a “strategic investment” worth pursuing no matter what the cost or benefits. From memory, the $1.8 billion of the East-West link is to save 6 minutes in travel time. Spending $50 million to save 3 minutes seems like a no-brainer. Or how about comparing the third main with the Kirkbride Rd intersection project, which the government deemed so important they funded it out of general taxation? The only way to reconcile the government’s position on this project versus the ones they have funded is that they’re biased against rail. This just reinforces the corruption of the transport decision making process. While paying lip service to BCRs as the main arbiter of whether a project should receive funding, the reality is that central government funds only those projects that suit its prejudices (I was going to say “policies” but there’s little evidence that decisions are driven by policy). Surely even the right-wing apologists for building more roads would support more straightforwardness on this, rather than obfuscation. I’m as right-wing as it gets (economically) and I say build it now… heck, build a fourth if it makes sense. Given the benefits case, it probably would’ve happened if there was a profit incentive rather than a (lack of) political one. I can’t help but notice there is no mention of running express passenger services on this 3rd main. This would be a concern as AT’s 2025 running pattern shows express services from the south. Also there is the potential for Hamilton trains. 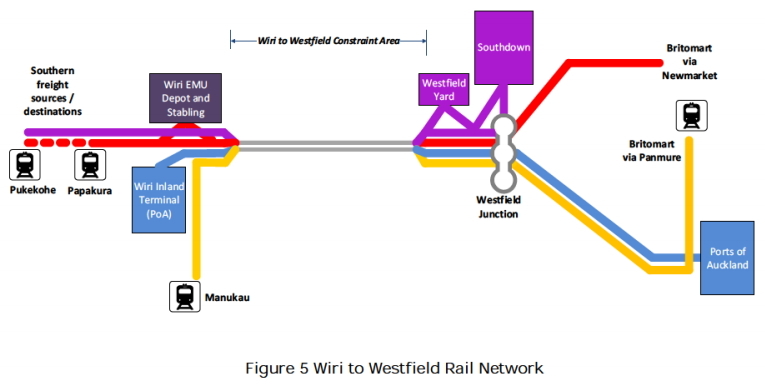 Actually when I look at that running pattern again it bafflingly runs express on sections of track outside of the 3rd main but is all stops on the Westfield to Wiri section, so they are clearly not planning on using the 3rd main. God knows how they plan to make it run express from Panmure to Britomart. I don’t know about baffling, they clearly hope to run those three trains an hour express on the sections of network that only have one suburban line, and expect to stop anyway on those that have two suburban lines. It seems kinda ambitions to me, and wouldn’t folk from Pukekohe rather just have a train every ten minutes that does the same thing? Presumably they’ve assumed the third main is freight only. I think there would definitely be demand for those express services, as we have seen in the past. However, there is no point running them if they do not have a dedicated track, therefore it is better to offer a frequent all stops service. Good point, with both up and down freights sharing the 3rd main its not easy to see how an express intercity passenger service would find a pathway. Maybe they should build a third main then, and not a freight track. I.e. Have three lines, all electrified and bidirectional signalling, so that any and all trains can use any and all tracks as required. Because there will be pressure to fill them all up with metro services & freight will get shut out. But then KR also say keeping ETCS (passenger) services separate from non ETCS (freight) traffic on different lines is a key benefit of the 3rd main. Which is then surely lost if we put passenger trains in any form on the 3rd main and don’t also invest heavily in ETCS for freight. Which the document says is not worth it given the expense of doing it. Does implementing the post CRL cross town purple line from Henderson to Otahuhu mean they would be using the 3rd main necessarily? Not sure if the third main would be positioned west of the current main two lines well clear of the 3rd platform there (I guess currently a passing loop) or would the line running by that platform actually be the new line as well? I had been thinking the same as the existing section of third main is to the west of the current two main lines. Not unless the lines are reassigned so that the present down main becomes the third main, unlikely as signalling would need to be moved too. That unused platform at Otahuhu looks like it will be a passing loop. There appears to be enough space between the up main and up arrival road (3rd main) to have another Otahuhu platform and extending the concourse to it. That would be good for the purple line, express services and perhaps an Otahuhu line direct to the airport and maybe for the 4th main. $250,000 hours in travel time savings is $1.25m, not $4m. No matter what the actual $ figure is, how many way more expensive roading projects have been pushed ahead in the past on the basis that they will achieve value of time savings that are way less [some only a few seconds] a journey? If this was a roading project it would be being pushed ahead of anything else to get built as the impact of not having the so-called “do nothing” option is huge. I doubt East West in all its glory could deliver that level of time savings to the SOV drivers that are expected to use it in droves [and whose numbers, and thus time savings are being used to justify it getting built in the first place]. Seems that all BCRs across all projects are equal, but this make it seem even more that some are way more important than others – but only when its a roading project. +1, I think the case for the third main is amazing. Sure, we can assume that some people aren’t communting, but it decreases the value of time if we do that. We still only get $6.60/hour. Even if we use the values for passengers in a car instead of passenger on a bus/train it only increases to $5.59/hour or $7.24/hour, respectively. The value of a person’s time when they are doing anything other than actually working is really, really low. How so, Harriet? Surely you would want public transport passengers to have a lower value of time as spending half an hour on a bus is much more useful than half an hour in a car? Sailor Boy, not the “all time periods’ and “2002” at the top. If you covert to 2017 dollars, at peak times and split across known trip uses, you get about $16 per hour. This makes the value of train users’ times somewhere between $6.09 and $10.50. Still a lot closer to $5 an hour than the $20 an hour Matt quoted. No it will only be peak, because it’s only constrained at peak, so the travel time savings will only accrue at peak. Admittedly I haven’t read the entire report, but I see no reason to believe that the trains are only delayed by freight trains at peak. Yes you are right. Alot of passenger movements on the rail itself conflicts with other services resulting in delays. Additionally, stopping and starting freight trains is very costly and can result in further delays. If a freight train does result in 2-3 minute delays in passenger services, so what. These emus are fairly capable in making up time. Especially about the Papakura and pukekohe area where the bottleneck starts. Wiri is a bit different because of the extra services joining the NIMT mainlines. This is exactly why we need the third main. And why it would start south of wiri junction. Any services on the 3rd main would not conflict with manukau services AT ALL. Regardless of what the EEM says, $5 per hours is obviously too low as a value of time. The real world value would be more than double that, bearing in mind that it is supposed to be an average, not a minimum. You could also add in a significant saving in rail operating costs. 300 hours saved and less stop start travel would save a freight train a lot of fuel and driver costs. Is it too low? I’m guessing that you have no empirical basis for this, but what’s the logical basis for it? Everyone seems to assume that I’m dumping on the case for the third main. I’m not. In fact, the case is so good that I don’t want opponents to have the opportunity to dismiss the case through a calculation error like this. I completely agree with your comments regarding freight trains. Another big benefit is that we effectively get two new EMUs completely free by saving 3 minutes for 40 (2/3 of the fleet because it’s roughly 2/3 of services) EMUs on a one hour run. The EMUs are $5m each and the BCR of buying more is higher than 1, right? So that’s at least $10m in benefits right there. So for the third main we have already found $30m of benefits from travel time savings. That’s without talking about mode shift, additional walking and cycling to stations, decongestion benefits, operating costs, CO2, or even mentioning freight trains! Sorry I did not mean to sound critical of your efforts and I support your intent. Assuming you are correct on the VOT I was being critical of the guidelines. From the NZ stats latest published survey (2015) median hourly earnings is $22.83/hr. This is the sort of value I have seen used in motorway calculations. I think we can reasonaly conclude that the benefits are much more than $30 million. Let us say $250,000 hrs/yr x $22.83 = $5.7M per annum plus the value of trains saved ($10M). At 6% that will work out to an NPV of around $105M NZ. Yes, that is the median wage. However, you would need to use the mean wage including all New Zealanders out of work to account for non-employed people on the train, and it’s irrelevant because this is the *economic* value of time, not the *financial* value of time. The value of travel time per *vehicle* on a motorway is frequently assessed as approximately $20/hour. My per vehicle calculation above probably works out to almost $1,000 per vehicle hour for the train. This is significantly higher that the value per *person* on public transport for several reasons. 1) A much higher share of motorists are travelling for work purposes (not to work, as part of their job). 2) Often more than one person is in a vehicle, including the passengers in a car or truck, or an entire busload of people travelling from Hamilton to Auckland ($420 an hour assuming $6 per public transport passenger and 70 seats). 3) Per vehicle costs include the travel time costs for freight, which we have explicitly excluded in the discussion above. I think that your $105m for travel time savings is probably in the ball park *if* you are including the travel time costs for freight, as that will be far more economically valuable than the passengers, just like it is on a motorway. I wouldn’t go so far as to say that the government’s reaction to this can be called corruption. But it is certainly suggesting that the lobbying of the trucking lobby is affecting government policy in a way that is not economically effective or fiscally responsible. That is a worry. For a government that is quick to say it is fiscally responsible, it seems very willing to back projects that do not stack up financially. Their myopic focus on roading is really clouding their judgement. Why don’t they do these things right the first time and quad-track that section rather than build just a third track only to go back and move things again to build an inevitable fourth track later? It seems like quad tracking is needed all the way to the port yet it doesn’t seem like it’s been planned for during the station upgrades. +1. It’s a huge Safety in Design risk to have to go back in and add a fourth line in ten years time. The alignment of the two mains as they are now is for the most part, quite well placed to add the third main in without much extra work. Large stretches of the track have lain in the exact same place for decades, some bits for a century, so the formation is very stable and drainage conditions are well known. Only a few spots here and there will need to be tweaked. Adding the fourth will require a much larger proportion of the existing track to be shifted one way or the other to make room for all four, thus abandoning the tried and tested under-rail formation and known conditions for a clean slate and somewhat more of a geological lottery. The upshot is that the fourth will be much, much more expensive than the third, regardless of when it is done. The works required at Middlemore for a fourth will also be enormously more expensive, intrusive and disruptive than for the third. Paying all that extra now would turn out to be a very expensive preemption as the fourth main a) might not be required or funded for over 20 years, and b) might not be needed at all if either the Port itself or the inland ports are moved. What has been done for a while now is to make any new bridges wide enough for four mains. The Jutland Road bridge and the Takanini Motorway bridges, for example. I always found it interesting that when the OLE was installed that near all the OLE supports and their concrete foundations are positioned to allow for a third main and its wires to be installed with minimum additional structures. Not so much for 4th main, that looks much more difficult. WIthout the 4th main there is probably sufficient locations, eg Papatoetoe, for long overtaking loops next to the 3rd main. At the Wiri end the 3rd main trackbed and some track appears to head further south for a Km or so until it combines with the NIMT up main. Going south from Wiri there is quite a few Km of trackbed and the remains of track beside the down main, suitable for section of 4th main? this coverup is starting to look very dodgy. Just why would the minister want to prevent the release of such info? So they can keep some Election handouts announcements up their sleeve to ensure they can throw some scraps to the Auckland voting population if the natives start looking too restless before September 23. Might make his favourite road boondoggles look even less economic than they currently do. Particularly if the redacted stuff gets out. Quite the opposite, more rail freight actually means more trucks to get it too and from the rail and that all happens at Southdown that is accessed off Neilson St. The East West link takes the through traffic off Neilson St making it easier for those that need to be there, ie trucks delivering/collecting rail freight. Harriet has done us all a favour with this. I don’t care about a freight line one way or the other. But this has given us a glimpse of how Ministers of the Crown work and how they try to subvert the law they are supposed to work under. The result is we should never trust that Minister. Thats the funny thing. This freight track isn’t really a big deal. It’s a small fry project that is arguably needed right now, but will certainly be built sooner or later regardless. Why burn political capital on chicken feed? To protect the larger and politically more important golden goose (aka the EWL) perhaps? What is their excuse for not releasing the BCR? How can that be commercially sensitive (assuming they don’t show their working, just the end BCR)? I’m just shocked NZ continues to rank so high in corruption perception indices when behavior like this is happening. It’s a relative ranking, I’d be surprised if there is any country where this sort of stuff doesn’t happen. The real difference between NZ and some of the countries on the list is the lack of bribery. It’s just about impossible to pay off an official in NZ to get something done for your benefit. Also the fact that this behaviour over a relatively trivial piece of government spending is getting sunlight shone on it is very much in our favour. Most of the corrupt practice in New Zealand is done openly rather than secretly and usually not for personal profit. For example Councils regularly issue their own Resource Consents without applying the same standards they do to private applicants. Similarly they will try and use the RMA process to stymie people who they think might compete with one of their own development projects. We dropped this year in the Reporters without Borders Index from near the top to 13 as a result of this kinda stuff. This comment is in breach of our guidelines and has been removed. Why because if we let in a whole lot of people from countries with rampant corruption and then our levels of corruption go up in line with this immigration we aren’t allowed to join the dots? Unnecessary censorship to protect what agenda? It is a valid observation and in this case related to how in bed the National party are with various people/businesses/foreign interests. To assume that all people from countries with corrupt governments are themselves innately corrupt is the literal definition of racism. Take it elsewhere, or better yet keep it to yourself. I fear that the resignation of Simon Bridges as Minister of Transport would make little overall difference, since the whole National Party (and presumably most of its supporters and voters) seem to be OK with their “Roads regardless” policy. Bridges would no doubt be replaced by someone else approved by Steven Joyce. The only answer to this cosy corruption is to change the government to one with a different set of priorities and different set of values. A completely clean-sweep, starting with the PM and the Minister of Everything. We have a chance on Sept 23. Isn’t it interesting that NZTA spend billions building rural and urban freeways with capacity that will be needed to handle traffic volumes forecast to occur up to 20 years after opening, yet we cannot get money to upgrade a rail line with capacity that is needed now? Interesting reading the report, bits that could be at least. Wonder what the blanked out bit in the Table 3, on page 29 across from: “Separate freight & passenger services in space” just under “Add a 3rd Main Line” is?? Add another line somewhere else, move port? truck everything by road? quit passenger services? Seems strange it’s blanked out. Given where it is and the context of the options being discussed it precludes moving more stuff by road as thats discussed in another option. So likely means KR is proposing to move the MetroPort(s) or POAL port [further south?] out of the way of the passenger lines. The text of the report that redacted section relates to is (so called) Option 5, its option 5 because it appears between text named options 4 and options 6, and the discussion text appears on bottom half of page 32 and top of page 33. If you want to read that text yourself you may glean some info. But from my reading of the redactions I think two options under option 5 are discussed as there two sets of bullet points each of 2 items long. My bet is this option involves changes to where either or both the Metroport or POAL is located, If so this will change the business case for the EW link completely. which is likely why its redacted and why the Ministers office got so antsy about that getting out. even if its redacted for the wrong reasons, by the time the truth comes out, the EW BOI will have finished its work, and the decision made. So this is all an attempt to impact the EW BOI. [After all if Metroport is not where it is now, what is the rationale for choosing EW option F over the other options?]. Yes I do as well. But I don’t see how it should eliminate the requirement of the third main. Well if Metroport wasn’t where it was [it was say further south like where the Wiri inland port that POAL uses is now], and/or POAL moved to either the Firth of Thames coast or threw its lot in with Tauranga. Then there would be lot fewer freight operations on the NIMT so the reason/justification for the Third main got a lot weaker. But thats a side show, but either or both of the moving of either Metroport and/or POAL operations is probably what is covered under “option 5”. Which is under the section of “spatial separation of freight and passenger trains”. If Metroport is moved then third main is not needed as much [but POAL could still use it]. If POAL moves and Metroport stays put [and probably becomes equally used by both POT and POAL], the third main would very much still be needed and if anything the need for a 4th main would materialise as well. But Option 5 has been redacted because obviously this part is all hush hush stuff and if Metroport moves then the EWL BOI process underway right now, could be impacted [i.e. EWL is denied]. Which Joyce and his trucking industry mates do not want to happen. This side of the election anyway. Best explanation I’ve seen thanks, Greg. The panic from the Minister’s office seemed overblown otherwise. Even if metroport was shifted, which is highly unlikely. The third main must surely still be a priority. Or are they going to ship 10,000’s of extra containers on Auckland motorways? I suppose that is determined by final destination of the consignment which would take a tremendous amount of research to follow any typical patterns. Some useless information, but rumour has it metroport will expand, and it will be at otahuhu mainly utilising the current railweld site after its relocation. Interesting. Toll is building a large rail-served facility adjacent to Pacific Steel. Might explain why NZTA keeps mentioning Otahuhu in connection with the E-W Link, although I can’t see the relevance. Thats mentioned because EWL Option F is being sold as a combined motorway plus PT improvements package. The PT side of EWL is nothing but a greenwash fig leaf and covers “improved” bus operations/priority between Mangere town centre, Otahuhu and Sylvia Park. But its joined at the hip to option F by NZTA [even though the PT improvements do not require or depend on option F], but EWL Option F needs a PT fig leaf to cover its pure MOAR ROADS nakedness. In any case the PT improvements proposed for EWL are odd considering that most of the workers who have the least public transport options currently are all those who actually work in Onehunga and the industrial environs around Metroport. And no one is proposing any PT improvements of note for them with EWL Option F.
Anyway if Metroport moves south to be adjacent to Otahuhu, makes even more of a messy interface with EWL Option F [and probably tramples all over the PT improvements proposed]. I don’t think we would see metroport relocate. But I do think it will expand, and maybe perhaps otahuhu is an area they are looking at. In regards to Toll nz, yes I believe they are relocating next to bluescope steel Otahuhu. Is it Possible for rail to service the wharves again? Rail does serve the Auckland port, if that’s what you’re thinking of. In to the container terminal. I’m the Ports of Auckland comms guy. I can absolutely 100% confirm that we are NOT in any talks or even considering moving Wiri. We’re developing it for the long term. Here’s the latest development. http://www.nzherald.co.nz/business/news/article.cfm?c_id=3&objectid=11877419. I doubt Metroport is moving either. Reckon that section relates to something else. Each option listed involves greater infrastructure intervention on the rail network than the one before. So the option after triple tracking would be what? Just thinking aloud – probably misguided – but wouldn’t a 3rd main also create a possibility of passenger express service or passenger limited stop service during peak – for example if Hamilton trains ever eventuate, they could skip some/most of the stations on our network…? or is that completely not possible? I would say quite possibly, but your express train would compete for slots with freight so it’s a clear trade off. A third *and* fourth main would give a lot more scope for that sort of thing. +1, the fourth main should have at least been an option in this report, it definitely seems better than adding the third now and then coming back later. I assume most of the $50M cost to add track between Puhinui and just north of Middlemore is the replacement or lengthening of the St George St and Bridge St bridges, and rework of the Middlemore platform? No, those bridges are already wide enough for three tracks. All the bridges between Wiri and Westfield are ready now. Homai and Manurewa is where the bridges will need to be replaced, but that’s a distant future project. Middlemore platform bypass would be the single biggest chunk of cash. Widening the embankment between Middlemore and Papatoetoe might be the next biggest task. I think the problem here may be that KiwiRail have gone ahead and done the very thing we all want to see happening – put together a business case, using NZTA formula, demonstrating a positive BCR, etc, to seek funding, exactly as NZTA does for roading projects. But, KiwiRail isn’t supposed to be doing that in the eyes of the government. Such an approach for funding has never been put into any official framework for how KiwiRail is supposed to operate. And where does the money come from? The consolidated fund? Again, the government has no source of funding for KiwiRail. They just go on asking for handouts each year, and the government scrapes the bottom of whatever barrel they can find. Good on KiwiRail for trying, and hopefully the review of KiwiRail to establish an ongoing and permanent funding mechanism will formalise this very kind of targeted approach to rail project funding requests. There is however another issue, not directly mentioned (unless it’s redacted), and that is the long held stance of AT of being unwilling to contribute any funding to the third main project. KiwiRail’s original plan was to fund it with AT on a 50/50 split, and KiwiRail actually budgeted their share from earlier government handouts. They were very close to proceeding, which is why they actually started the work, which later stalled. AT did not come to the party with their share, and made it clear they never will, despite the huge benefits to their services. I am beginning to suspect the reason for this may have something to do with the fact that the project is of enormous benefit to Port of Tauranga, and will harm the viability of Ports of Auckland. It may be that AT have decided it is against their interest to support the W2W project. KiwiRail have had to go it alone, and so this second attempt is somewhat flawed in that the business case demonstrates significant benefits to AT services, but AT have not partnered with KiwiRail for the funding request. It may be that the government finds it inappropriate for KiwiRail to be seeking funding for improvements to AT services. AT really needs to get onboard and work with KiwiRail to get it over the line. +1, if AT pay for half of this then I assume they will receive half of the track access fees? You’re right, to date, except…. … when its CRL, when AT (via AC) is paying at least half of the cost, and the issue of track access fees and ongoing ownership seems to be on this Gov’ts agenda for discussion. So the Gov’t it appears not keen on giving Aucklanders a hand out to build CRL like some assume is the case. Exact form is probably TBA, but likely another “interest free” loan of sorts [or guaranteed assets sales] for AC to pay the governments half back in due course. I see Joyce’s hands all over this! Wellington ratepayers have not funded the Wellington rail network. Why should Aucklanders? NB: Simon does state more than once in this video interview that the 3rd main project should go ahead. Hmmmmnnnnn. Very very interesting. At 14:00 to 15:11 He said that this was an early iteration of the report so there must be a later more up to date report available. where is it? He also says that at that stage he hadn’t seen this report so he was uncomfortable with it’s release. Either he is holding back some later report that he was aware of for he is very much in favour of the 3rd track. I can imagine it’s hard, long, and very bitter pill to swallow. The only positive thing about that interview was that he agreed to be interviewed even though he probably realized he was on a hiding to nothing. Never heard so much bs, excuses and hiding behind bureaucracy although loved his assertion that the EW link has a BCR of 1.9, does it indeed? and that he had never read the 3rd main business case until yesterday. Mr Boshier says no minister has the right to interfere with the Act and agencies should be able to make their own rulings unobstructed. Mr Bridges is standing by attempts by his office to block the request. “There are really strong grounds, over a long period of time in terms of convention, practice and the law, as to why my office I think was right to say ‘no, this shouldn’t go out’,” he told The Nation on Saturday. Can someone put an end to this Transport ministry subterfuge and subsequent speculation over the 3rd main business case by, already, just leaking the full document with no redactions. that would be the sort of thing winnie would do I expect.